Herefordshire Lore has been collecting, publishing and archiving people’s recollections since 1989. Herefordshire Lore works to remember, celebrate and record Herefordshire’s past history before it is lost with passing generations. It is run by a group of volunteers who design, plan and gain funding for projects.A diverse range of resources have been published including the quarterly ‘In Our Age’ which can be read on this website. To get a the latest print version please subscribe. We have published books (River Voices, 2018, Women at War – In The Munitions, 2003; A Slap of the Hand – The History of Hereford Market 2007), booklets (Amazing How Times Change, 1992; The Shopkeeper’s Tale, 1996; The Schoolchildren’s Tale, 1997; Milk, Herefordshire; 2012), and magazines from Age To Age to a decade of In Our Age. We have talked to people from all walks of life from munitioneers, housewives, farmers, railwaymen, domestics and butchers to shop keepers, cattle dealers, publicans and priests. Herefordshire Lore owes its existence to their memories. Our thanks go to our many contributors and funders especially the Heritage Lottery Fund. Herefordshire men and women relate their experiences of the First World War. The stories are based on original recordings made by the county reminiscence group, Herefordshire Lore and Herefordshire’s Home Front in the First World War by Bill Laws. Read past issues of ‘Age to Age’ – Hereford Lore Reminiscence Newsletter on our new ‘Age to Age’ page. ‘Age to Age’ was published bi-monthly by Hereford Lore, before we became Herefordshire Lore, from 1993 to 2003 and was the fore runner of our quarterly magazine ‘In Our Age’. Alf Evans’s recollection from 1942, ‘Tragedy Strikes R.O.F.’ from 1942 published in Volume 1 Issue 6 in May 1994. Why in 1957, when the Queen visited Herefordshire, a pig took centre stage in ‘Pig meets Queen’ by Betty Moore published in Volume 4 Issue 4 in July 1996. Gladys Sweeney recalls memories of cleaning railway carriages in Barton Yard (now Sainsbury’s) during the war published in Volume 10 Issue 6 in December 2002. In the summer of 2017 a team of Herefordshire Lore interviewers travelled up and down the river, speaking to swimmers, walkers, anglers, ferry women and men, canoeists, bailiffs, ghillies, poachers, bridge keepers and more, recording their stories from this lovely river of ours. From landing a 40-lb salmon at Ballingham, shopping for Devon Minnows at Hatton’s, using the Hunderton ferry river crossing, chasing poachers at Symonds Yat, walking on a frozen river at Whitney-on-Wye, rescuing stranded villagers in flooded Letton, to home-made canoes in Hereford, these are just a few of the tales gathered, illustrated alongside hitherto unseen photos, an excellent record of life on the Wye in a book published by Herefordshire’s Logaston Press. We are grateful to the Heritage Lottery Fund for making this project possible. Thanks also to our match funders: Hereford City Council, Monmouth Building Society, New Grove Trust, William A Cadbury Trust, the Wye Valley ANOB, Terry, Carol and Wesley Mason. 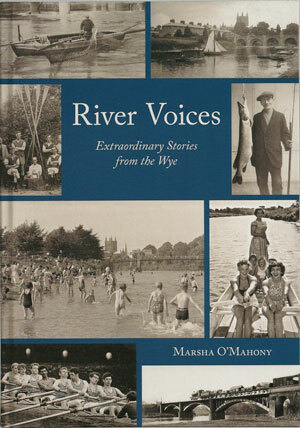 You can purchase River Voices for £10 plus £2.50 UK postage and packing per book. It costs only £15 a year to receive In Our Age (four issues a year). Group subscriptions (10 copies a time) are still only £30 a year. Ensure that you include your address including postcode. 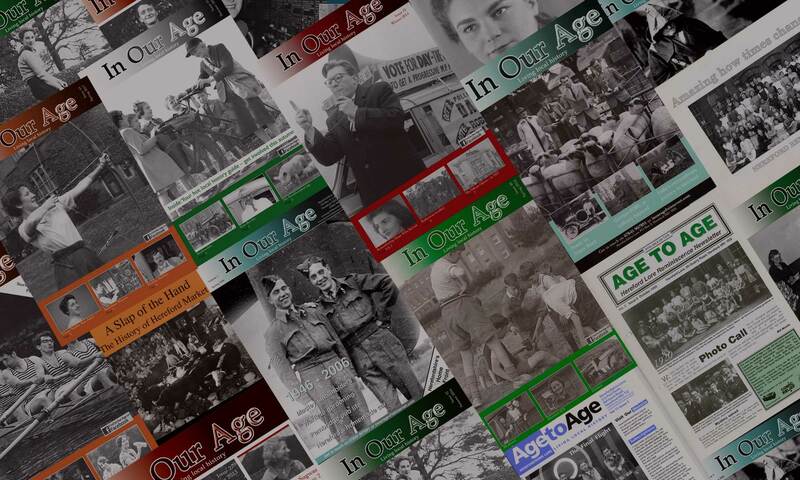 Every issue of ‘In Our Age‘ is available to read online so that people far and wide can read it. However local volunteers work on the magazine and website to give you this fascinating history of Herefordshire. So why not donate to Herefordshire Lore so that we can keep publishing the paper version of ‘In Our Age,’ that is read by so many people who do not have computers or the internet?